Dan Bejar started Destroyer as a solo home-recording project in the early to mid-nineties. In 1996, he released his debut full length of stripped-down, lo-fi electric folk, We'll Build Them a Golden Bridge. Soon the Destroyer template expanded to include a rhythm section, and Bejar was compelled to head into a proper studio to record City of Daughters in 1998. It was with Daughters that Bejar began to develop his own unique lyrical voice, a voice that continued to evolve and refine itself over the course of his next two records, Thief and Streethawk: A Seduction. Destroyer seemingly had produced its masterwork with Streethawk, a highly refined send-up and condemnation of popular culture, an idea honed to razor-sharp precision. The album became one of the most acclaimed recordings of 2001, and the Destroyer mystique captured music fans and critics alike. This Night, the Destroyer debut for Merge, is an epic full of indulgences and flights of fancy-the perfect foil to the sleek and streamlined approach of earlier recordings. This Night both baffles and seduces, leaving jaws on the floor and confounding both fans and critics. Bejar took another turn towards the unexpected with Your Blues, his second recording for Merge, wherein he stripped Destroyer down to its barest essentials once again, with MIDI-synthesizer symphonies that explored what Bejar dubbed "European Blues," a vainglorious retreat from American rock traditions, celebrating an exercise in old-world excess within limited means. Those who had been pining for a new Streethawk were left shaking their heads, forced to admit that the last thing Destroyer was ever going to give them was anything close to what they expected (or hoped for). Bejar had everyone right where he wanted: dazed, confused, and not knowing what was to come next. What came next was yet another triumph. Destroyer's Rubies was hailed as the second coming by many longtime fans and firmly established Destroyer as a critical and commercial success without ever having compromised Bejar's vision at any point along the way. On its March 2006 cover, The Fader proclaimed him "Rock's Exiled King" and we could not agree more. But it was a case of self-imposed exile, as Bejar and company have never had much use for the trappings of indie-rock "fame." Trouble in Dreams (2008) continued Dan Bejar's lyrical and musical assault on all that is stagnant in modern, popular music. His is a body of work that consistently flouts convention in favor of musical leaps of faith, statements of purpose cloaked in subterfuge, and the joyous refrain of an optimist's heart cloaked in cynicism. Anthems sprawl with shifting layers of guitar and piano, spinning just to the edge of chaos and back, while referencing fantastical realms and mysterious women who may or may not approve of our interloping voyeurism. Written during an extended stay in Spain during the spring and summer of 2007, Trouble in Dreams is both soothing and jarring, sparing us neither his lyrical bite nor pulling any punches. Trouble in Dreams is yet another brilliant entry in the astonishing Destroyer canon. 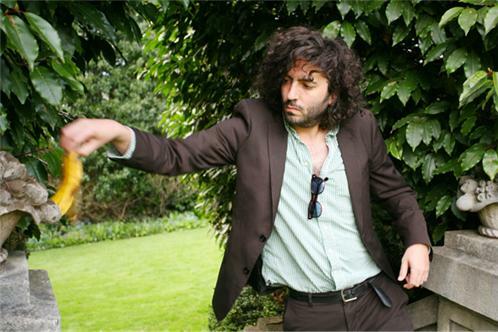 Over the course of his career as Destroyer, Dan Bejar has established himself and his band as one of the most unpredictable success stories in modern, popular music. As a songwriter, Bejar is recognized as having few peers. As a musician, he is like the court jester, waiting in the wings, poking fun at those who take themselves too seriously and skewering those who would celebrate commerce as art.